NEW ORLEANS — New Jersey’s favorite son was adopted by New Orleans on April 30 as Bruce Springsteen — through speeches and song — vocalized the anger, frustration, pain and resilience of this hurricane-battered city at the annual Jazz and Heritage Festival. Decrying what he called “criminal ineptitude” in Hurricane Katrina’s wake, Springsteen jabbed at the political powers he deemed responsible for New Orleans’ slow recovery. 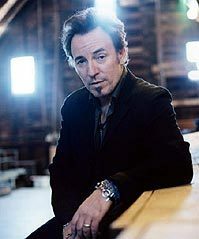 It was Springsteen’s first appearance at the event, the biggest musical happening since Katrina struck last summer. The rock legend, along with Bob Dylan and the Dave Matthews Band, were among the high-profile names who joined the city’s homegrown music stars for the two weekend-long festival, which kicked off April 28 and ends May 7. But it was Springsteen who may have provided the most poignant moments. Springsteen eschewed the big hits he’s most identified with and instead performed classic folk and gospel songs epitomized by Pete Seeger that are featured on Springsteen’s new album, “We Shall Overcome: The Seeger Sessions.” Though they were decades old, many of the songs seemed particularly relevant to New Orleans struggles — “Mary Don’t You Weep,” “Jacob’s Ladder,” and particularly “My Oklahoma Home,” which depicts a man’s loss of his home and family after the devastating dust storms there in the 1930s. By the time he sang the chorus, “Come on rise up!” the audience spontaneously rose their hands in their air, symbolizing the pain and the hope of the city. The festival picks up this weekend with Paul Simon, Irma Thomas, Keith Urban, Jimmy Buffett, Buckwheat Zydeco and Fats Domino, who hasn’t performed in public since being evacuated from his damaged 9th Ward home after Katrina.